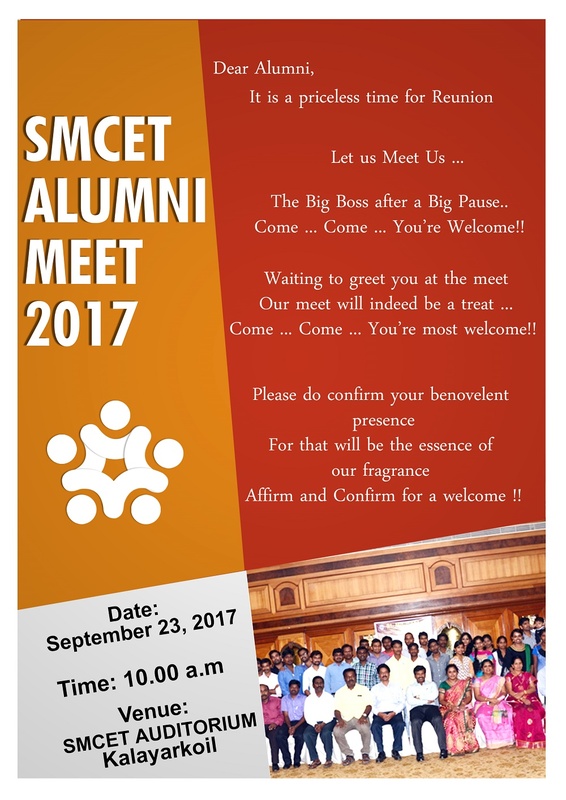 It has been decided to conduct the Alumni Meet-2017 at St. Michael College of Engineering and Technology, Kalayarkoil. Our College Campus has been fixed as the venue since many of our alumni have preferred this place and we too hope that it would be a grant reunion for all of you. This grant get together is planned on 23rd September 2017 which falls on a Saturday. We have vowed to make this Alumni Meet a memorable one for all of you and we expect you to come in large number. We hope to see you with your family and children as well. We assure you that there will be lot of events to break the monotony of speech after speech. Please do register and confirm your arrival. your arrival for we need to make other arrangements based on that.